Bob Hale is Professor of Metaphysical Philosophy at the University of Glasgow. His philosophical interests lie mainly in the philosophy of mathematics and the philosophy of logic and language, and he has written numerous articles in all of these areas. He is also author of Abstract Objects (Blackwell Publishers, 1997). Crispin Wright is Professor of Logic and Metaphysics at the University of St Andrews. He has published widely in the philosophy of mathematics, logic and language including Frege's Conception of Numbers as Objects (1983), Truth and Objectivity (1992), and Realism, Meaning, and Truth, Second Edition (Blackwell Publishers, 1993). Part I: Meaning and Theories of Meaning. 1. Meaning and Truth Conditions: From Frege's Grand Design to Davidson's. (David Wiggins). 2. Meaning, Use, Verification. (John Skorupski). 3. Intention and Convention. (Anita Avramides). 5. A Guide to Naturalising Semantics. (Charles Travis). 6. Meaning and Privacy. (Edward Craig). 7. Tacit Knowledge. (Alexander Miller). 8. Radical Interpretation. (Jane Heal). 9. Propositional Attitudes. (Mark Richard). Part II: Language, Truth and Reality. 12. Realism and its Oppositions. (Bob Hale). 13. Theories of Truth. (Ralph C. S. Walker). 14. Analyticity. (Paul Artin Boghossian). 15. Rule-following, Objectivity and Meaning. (Bob Hale). 16. The Interdeterminacy of Translation. (Crispin Wright). 17. Putnam's Model-theoretical Argument against Metaphysical Realism. (Bob Hale and Crispin Wright). 18. Sorites. (R. M. Sainsbury and Timothy Williamson). Part III: Reference, Identity and Necessity. 21. Reference and Necessity. (Robert Stalnaker). 22. Names and Rigid Designation. (Jason Stanley). 23. Indexicals and Demonstratives. (John Perry). 24. Objects and Criteria of Identity. (E. J. Lowe). 25. Relative Identity. (Harold Noonan). 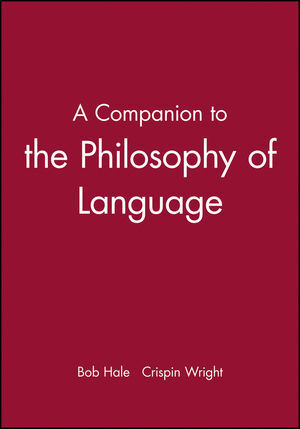 * Contains in-depth studies of an extensive range of issues central to current philosophy of language. * Extensive glossary and cross-referencing. * Contributors are active researchers in the field.